The Hull is to be cold-molded wood, consisting of 4 layers of 1/8” thick red cedar. The outside surface is to be sheathed 1 layer of biaxial firberglass reinforcement, and 1 layer of 6 oz finishing cloth. The stem and keel are to be laminated Honduras mahogany. The deck is to be 3 layers of 3mm marine plywood, sheathed with 6 oz finishing cloth. Epoxy resins are to be used throughout. Methodical weight control is a high priority, and all moldings and components are carefully weighed before assembly. The primary objective is to achieve a modestly sized open keelboat that is easy to get underway and to sail single handed or shorthanded in a boat that is lively, responsive, and fun to sail in predominantly light-moderate air New England. The target true wind range is 6 to 11 kts, TWS, although the boat will be able to be depowered enough to handle more breeze. The emphasis is on enjoyable sailing characteristics and comfortable deck ergonomics, sitting in on the cockpit floor, or out on the side decks. The typical crew will be one or two, but the cockpit should be suitable for an occasional party as large as six. 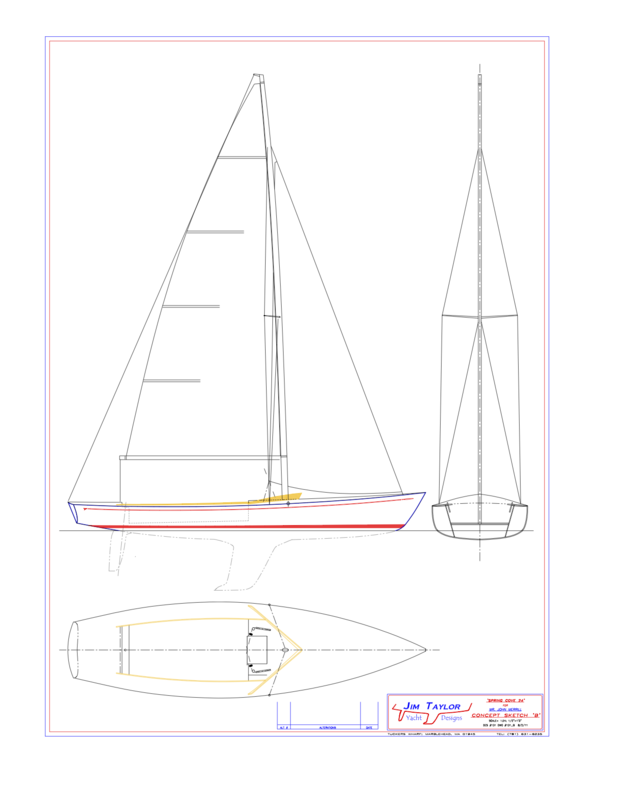 Classic and elegant aesthetics are a high priority above the waterline, but the underbody will be contemporary, and will feature a high aspect ratio fin keel and spade rudder. Performance is a priority, and is intended to match or exceed that of existing boats of similar size and type. The cockpit will be self-draining at the mooring, and self-bailing underway. There will be a small companionway hatch to give access to the bilge, the keel structure, the mast step and the roller furling drum under the foredeck. There will be a hatch aft to give access to the lazarette. There will be closed cell foam floatation under the cockpit and under the foredeck. Provision will be made to mount and stow an electric outboard motor and its 12V storage battery.